I love this add very much but I have songs that are in my native language (which is not a common one) and the add doesn't find lyrics to those. Is there a way for this add to get lyrics for these songs from a lyrics webpage from my country. Can I set that somehow? Or does anyone have an idea with which add can I do that? For the add to see lyircs from a spesific webpage? trixmoto wrote: They have to be in the right format for it to work properly. Any particular errors? Now that veroK mentioned it, I recall that there was an issue with blank lines in the lyrics. I used to copy timestamped lyrics from MiniLyrics editor and there sometimes was an extra blank line at the end that I didn't notice. It caused some kind of an error, but I don't remember what it said. Now I always check for that and remove blank lines, so the issue doesn't occur to me anymore. But I think it would be better if the add-on didn't react on things like that with errors, as there might be instances, where the user didn't notice an extra blank line, doesn't want the lyrics for a particular song to be timestamped at all, or wants to add /*comments*/ to lyrics, that must only appear in editor. I think it would be best if the add-on just skipped blank lines and lines without timestamps not showing any kind of notice, and just focused on timestamped lines. if you change the function getline in your script with the following code, you can bypass the problem with blank lines in the lyrics. Now that [b]veroK[/b] mentioned it, I recall that there was an issue with blank lines in the lyrics. I used to copy timestamped lyrics from MiniLyrics editor and there sometimes was an extra blank line at the end that I didn't notice. It caused some kind of an error, but I don't remember what it said. Now I always check for that and remove blank lines, so the issue doesn't occur to me anymore. But I think it would be better if the add-on didn't react on things like that with errors, as there might be instances, where the user didn't notice an extra blank line, doesn't want the lyrics for a particular song to be timestamped at all, or wants to add [color=#BFBFBF]/*comments*/[/color] to lyrics, that must only appear in editor. Ok, thanks. I'll take a look when I get a chance. trixmoto wrote: They have to be in the right format for it to work properly. WHAT format world that be? 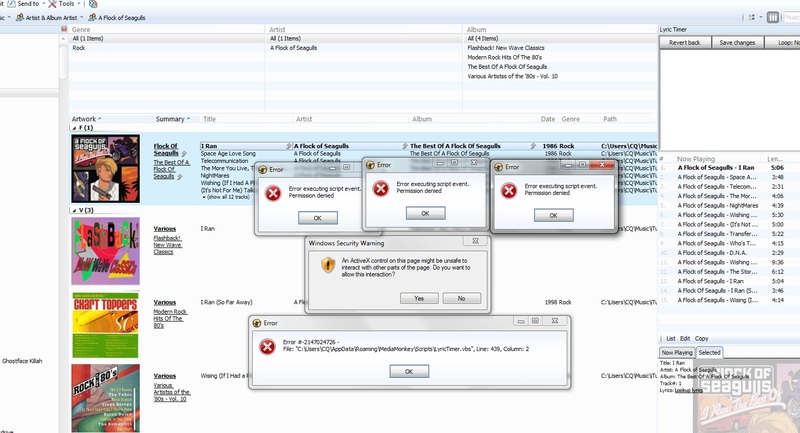 See image below for the errors that pop-up. I think the script should ignore any line that doesn't start with "[", but I'll double check it. They have to be in the right format for it to work properly. Any particular errors? It worked for me for a couple of songs that had lyrics on evilyrics. The one track I tried that didn't, gave me all kind of errors. Then I tried to ADD a timestamp line to a song and it crashed pretty spectacularly. Hmm, that's odd. I'll have to try and replicate. Thanks! The fix works great. It might have something to do with switching between songs that have lyrics in them and songs that don't, but it's not entirely clear, so it might be random. Access violation at address 009A6D4E in module "MediaMonkey.exe". Read of address 17FD07AB. Removing the line entirely seems to fix both errors without any side effects. New version (3.2) is now available to download from my website. I have fixed the sync delay when seeking in a track. Well, in that case, maybe instead of being a different plugin, the editor should open in some kind of "Editing mode" of the lyrics plugin. That way it will take the same space as the lyrics plugin (or maybe open in a non-dockable window which would close after user finished editing), which is very relevant as we don't have this functionality yet. Well, in that case, maybe instead of being a different plugin, the editor should open in some kind of "Editing mode" of the lyrics plugin. That way it will take the same space as the lyrics plugin (or maybe open in a non-dockable window which would close after user finished editing), which is very relevant as we don't have [url=http://www.mediamonkey.com/forum/viewtopic.php?f=4&t=75856]this functionality[/url] yet. Unfortunately it's not possible to change the way the built-in lyrics editor works, it would have to be a separate dockable panel for it to be done by scripting. trixmoto wrote: I think this would probably be a separate script, or at least a very different mode, as it would be a totally different way of displaying the lyrics. But I'll add it to my list. trixmoto wrote: I also used to have a "Lyric Timer" script that was a dockable panel and made it easier to create timed lyrics, but it's never worked in MM4. Yes, I tried that one. The first version of Mediamonkey I tried it with was 4.0.6 or 4.0.7, so... yeah, it didn't quite work. I like the idea, but I don't think a dockable panel is the best choice for lyrics editor, as the editor needs as much space it can get. What I have in mind is more of a modification of the standard lyrics editing field in Mediamonkey. I'm not sure if it's doable through scripting, but, if there was a way to replicate MiniLyrics' "Lyrics editor" controls and attach them to Mediamonkey's lyrics editing field, we could easily get rid of MiniLyrics altogether. I think this would probably be a separate script, or at least a very different mode, as it would be a totally different way of displaying the lyrics. But I'll add it to my list. I also used to have a "Lyric Timer" script that was a dockable panel and made it easier to create timed lyrics, but it's never worked in MM4.